By Rebecca Duffy | October 3, 2014. Saturday saw Kilkenny claim their 35th All Ireland SHC title, beating Tipperary by a narrow three point margin. 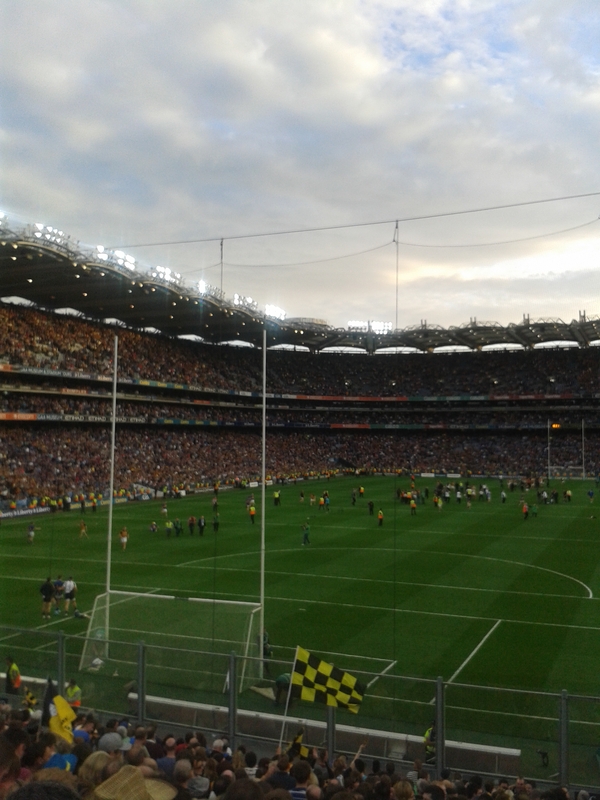 As 81,753 supporters gathered together to witness an epic All-Ireland replay in Croke Park, Kilkenny proved themselves to be the better team yet again as they maintained fierce intensity from the very first whistle. The first free of the game was awarded to Tipperary captain, Brendan Maher, in defence after a sharp catch which set the tone for a real captain’s performance. This resulted in the first point of the game by Shane McGrath three minutes into the first half. The point was closely followed by Tipperary’s first of three failed goal attempts within the first half of the match, which Patrick ‘Bonner’ Maher failed to secure despite a good attempt. 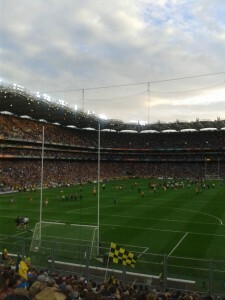 Noel McGrath got a point out of the missed goal effort, leading them to a three point lead (against the Cats) within the first four minutes of the replay. As the Kilkenny half back line began its crackdown against Tipperary, the Cats maintained the lead by forcing Tipp to play the long ball into their half back line. Padraig Walsh at right half back began catching a number high balls. He was assisted by towering half forward Michael Fennelly. As the half time mark brewed, Tipperary led by two points as full forward Séamus Callanan claimed the first goal of the game. Following half time, Kilkenny dove straight in, making their presence known as Richie Power hit a brash wide 30 seconds into the second half. In the minutes that followed, Eoin Larkin slipped a great ball to Colin Fennelly but the goal attempt was blocked by the Tipp keeper. Kilkenny claimed three points within five minutes of the second half, while Tipperary still kept fighting despite the Cats proving their strength by winning the majority of the balls. Frustration for Tipperary became evident as full back, James Barry, was given the first yellow card of the game. Noel McGrath seized the opportunity and scored the vital first point for Tipp after ten minutes into the second half. Another essential point is won by Tipp’s John ‘Bubbles’ O’Dwyer leading up to a great block by James Barry as the Cats threatened a goal on the 50 minute mark. Kilkenny continued to dominate but a penalty was awarded to Tipperary, taken and tapped over the bar by Séamus Callanan. This would later become the fundamental moment of Tipperary regret. What was to follow was a smashing goal by Richie Power in the 59th minute, giving Kilkenny a four point lead. Brendan Maher won another point for Tipp but a bombardment by Kilkenny resulted in a goal by John Power on his third attempt to get the sliotar into the back of the net. With two minutes left on the clock and five point down, Callanan won Tipperary an essential goal and restored a brief moment of optimism for the fans, until Colin Fennelly got a point for Kilkenny, restoring a three point lead. This secured the Liam McCarthy cup for their county. Kilkenny’s all time top scoring hurling hero Henry Shefflin returned home with a record breaking ten All Ireland medals. ‘King Henry’ made his appearance 57 minutes into the match and basked in all the glory during the victory lap around the pitch with his five-year-old son, Henry Shefflin Jr. on his shoulders. Though it was difficult to watch, Tipperary players and fans had the dream of bringing home the Liam McCarthy Cup slashed, there was no taking away from the triumph of the ever relentless Kilkenny.